Accent® Opaque’s Indigo Treated Digital papers are specially formulated to run on HP® Indigo presses. Rochester Institute of Technology, an independent testing facility for HP Inc., has certified these Indigo-Treated Digital Text and Cover sheets with 2 and 3 stars based on their simple 3-star rating system. These sheets are perfect for merchants, graphic designers and commercial printers looking to impress with their booklets, catalogs, manuals, brochures, direct mail, financial documents, reports, posters, flyers, sell sheets, invitations, greeting cards, menus, tent cards, marketing materials and more. 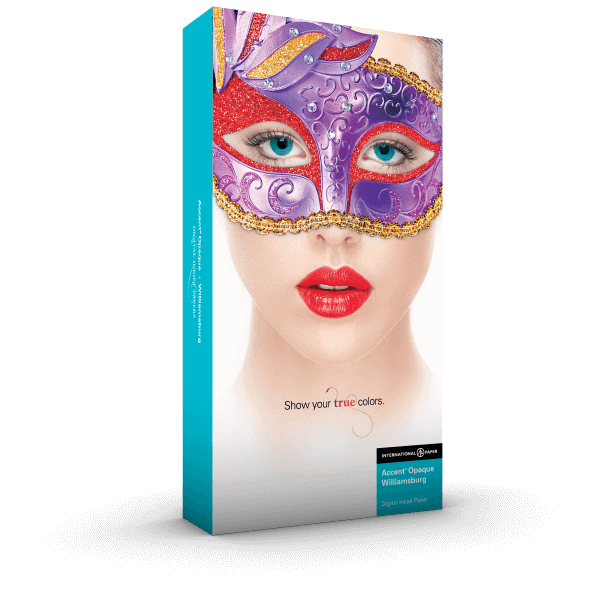 Accent® Opaque’s specially formulated Digital Inkjet papers are available with ImageLok®, ColorPRO, or Dyemond™ Technology and designed for both pigment and dye-based roll and sheet-fed presses. These treated papers are ideal for high-speed book publishing, on-demand books, direct mail, catalogs, financial documents, equipment manuals, reports, brochures, legal documents and more. ImageLok is a registered trademark and Dyemond is a trademark of International Paper Company. HP, Indigo and ColorPRO are registered trademarks of HP Inc.
ImageLok is a registered trademark and Dyemond is a trademark of International Paper Company. HP, Indigo, ColorPRO and ColorPRO Technology are registered trademarks of HP Inc.
Based on 25" × 38" sheet size. * indicates 60 smoothness on HP® Indigo 3-star rated items. *Accent® Opaque with Dyemond™ Technology is available as a make request. *Available as a make request. Accent® Opaque with ImageLok® cutsize cartons are FSC® Forest Stewardship Council® certified. Accent® Inkjet rolls packaged as single rolls. *Accent® Opaque with ColorPRO Technology is available as a make request. Experience Accent Opaque for yourself. Its the first of its kind – a swatchbook printed on 7 inkjet devices from 6 different equipment manufacturers demonstrating the power of treated sheets in the inkjet industry. Order your copy now!